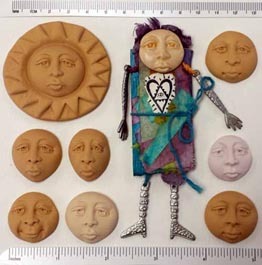 34 Craft Push Molds help to create dolls, figures, face beads, and more. Note: You may insert the quantities of all items that you want and add them to your cart all together. Click the yellow arrow at right of item# to return here. Below are thumbnails for fast links. 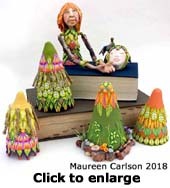 Quickly create your own clay figure using Maureen Carlson's push molds to get started. 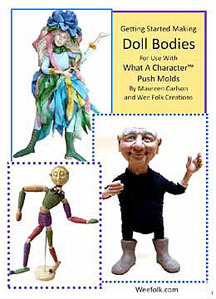 Free Making Doll Bodies Tutorial PDF, using our push molds. Caution: Our silicone rubber is not FDA approved for use with food products. 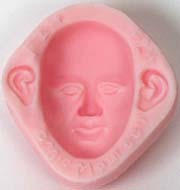 So we recommend using our molds for craft and art projects only. We are selling out all resin molds at a discount. Was $3.99, Now $1.99 while supplies last. We are selling out all resin molds at a discount. 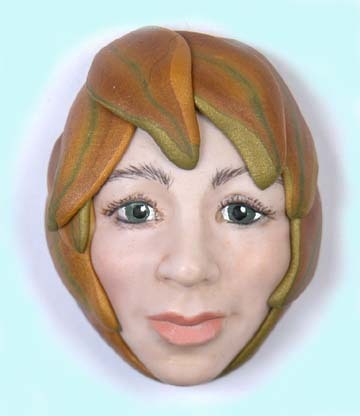 SALE: Cynthia suzanne, 1 in(2.54 cm). 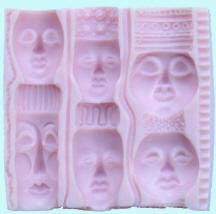 This 3.5 in(8.89 cm); square, flexible, rubber push mold contains 4 faces and 7 extra designs for enhancing each vertical bead. 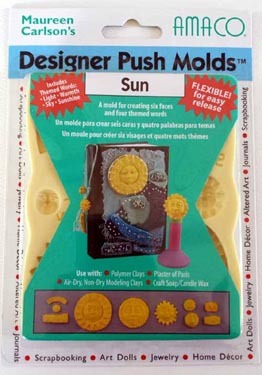 Link: Moldb instructional pamplet (in PDF format), is included with each mold. Add these 7 embellishments for variety. Look at what you can do with Mold B. 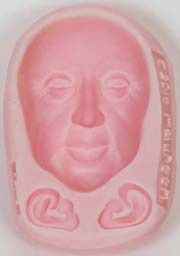 More examples for using this mold. 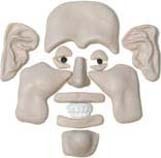 This 3.5 in(8.89 cm) flexible, rubber push mold contains 6 faces and 5 extra designs for enhancing each vertical bead. 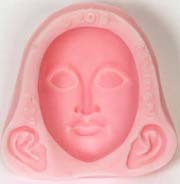 Link: Moldb2 instructional pamplet (in PDF format), is included with each mold. Add these 5 embellishments for variety. Look at what you can do with Mold B2. Link: Mold26 instructional pamplet (in PDF format), is included with each mold. 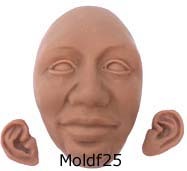 Link: Moldf25 instructional pamplet (in PDF format), is included with each mold. 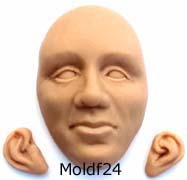 Link: Moldf24 instructional pamplet (in PDF format), is included with each mold. 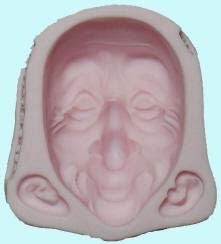 Link: Moldf23 instructional pamplet (in PDF format), is included with each mold. 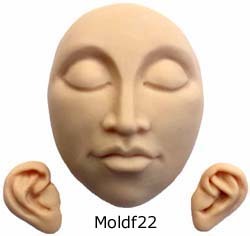 Link: Moldf22 instructional pamplet (in PDF format), is included with each mold. Link: Moldf21 instructional pamplet (in PDF format), is included with each mold. Link: Moldf19 instructional pamplet (in PDF format), is included with each mold. 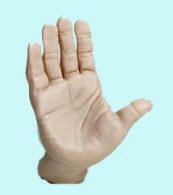 many requests, we have made it available again in this flexible silicone rubber format. Link: Moldb18 instructional pamplet (in PDF format) is included with each moldb18. silicone rubber format. We hope you enjoy it! 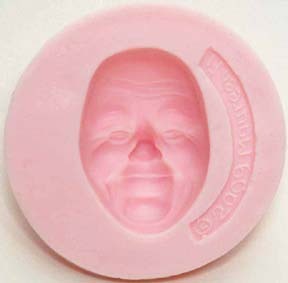 It has always been one of Maureen’s favorite molds. 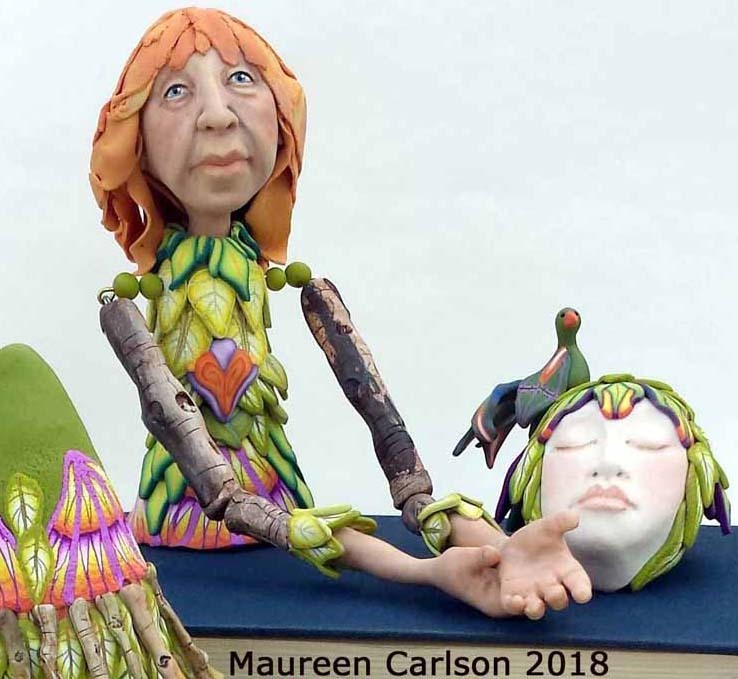 Pictured below is one of Maureen’s santa-elves. Moldf10, for the hands, and boot Moldb18. 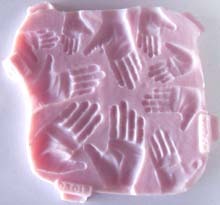 This mold was created to accompany our 5 small hands moldf11h. 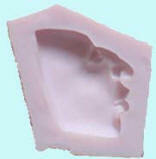 Link: Moldf12f instructional pamplet (in PDF format) is included with each mold. 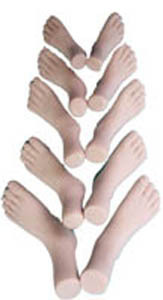 This mold was created to accompany our 5 small feet moldf12f. Link: Moldf11h instructional pamplet (in PDF format) is included with each mold. 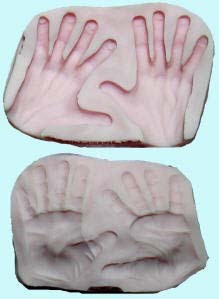 2 inch(5.08 cm) and 1 3/4 inch(4.445 cm) (4.445 cm)Hand Mold (front and back) used with a 2 inch(5.08 cm) to a 3 inch(7.62 cm) face. Link: Moldf10 instructional pamplet (in PDF format) is included with each mold. 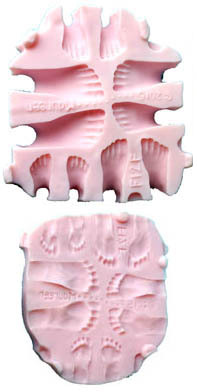 2 in(5.08 cm) and 2 1/2-in(3.81 cm) Foot Mold (top and bottom) used with our 2-inch to 3-inch face molds. 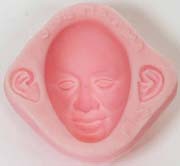 Link: Moldf9 instructional pamplet (in PDF format) is included with each mold. 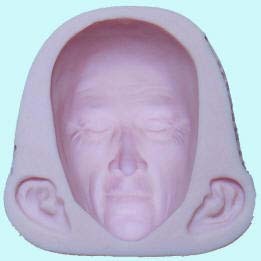 3-inch Foot Mold (top and bottom) for a 3 inch(7.62 cm) face. 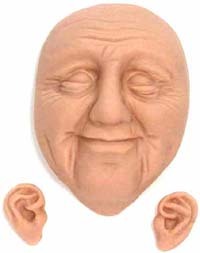 Link: Moldf8 instructional pamplet (in PDF format) is included with each mold. 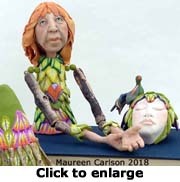 This face can be used with Maureen's Storykeeper Doll Pattern shown above. 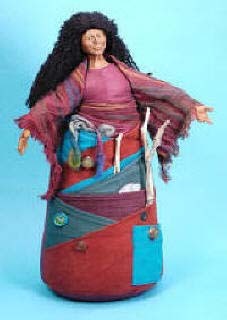 She's 14 inches tall and has many pockets to hold your stories. 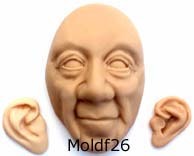 Link: Moldf7 instructional pamplet (in PDF format) is included with each mold. 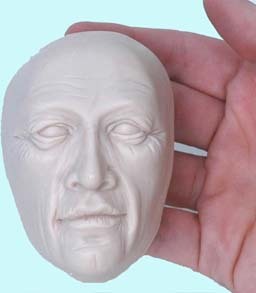 2 1/4" hand mold (front and back) for a 3 inch(7.62 cm) male face. 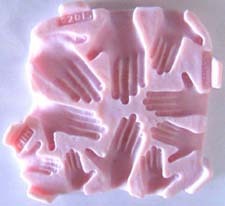 Link: Moldf6 instructional pamplet (in PDF format), and a hand pattern is included with each mold. Note: to print the mold pattern to scale, select print preview and set the scale to 135%. Then print the pattern. 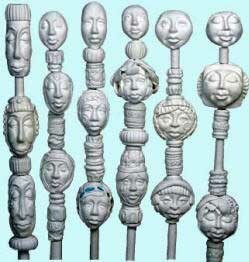 Price: $20.00 each mold or (2 or more at the same $20.00 price @$18.00 each) . 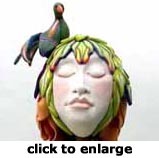 Moldf5, a 3 inch(7.62 cm) whimsical male face(with ears). Link: Moldf5 instructional pamplet (in PDF format) is included with each mold. 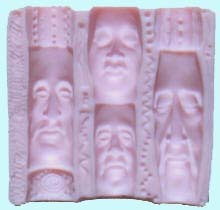 Price: $14.00 each mold or (2 or more at the same $14.00 price @ $12.00 each). YouTube how-to video about MoldF3, F4, and F5. 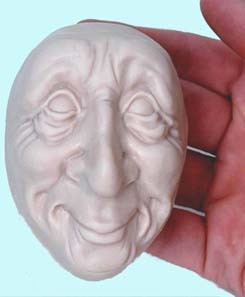 Moldf4, a 3 inch(7.62 cm) jolly male face(with ears). Link: Moldf4 instructional pamplet (in PDF format) is included with each mold. 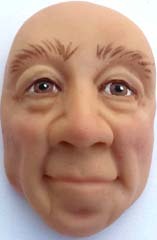 Moldf3, a 3 inch(7.62 cm) serious male face(with ears). 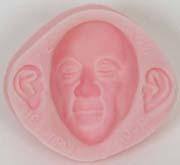 Link: Moldf3 instructional pamplet (in PDF format) is included with each mold. 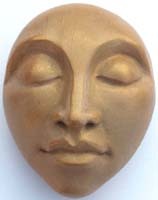 Moldf2, a 2 inch(5.08 cm) profile face. 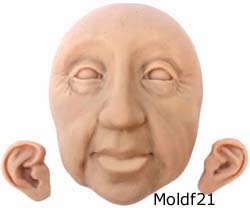 Link: Moldf2 instructional pamplet (in PDF format) is included with each mold. 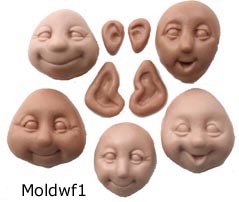 Link: Moldf1 instructional pamplet (in PDF format) is included with each mold. 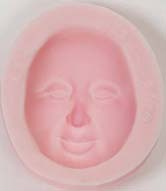 Mold A, 4 feminine faces with serene expressions, all in one mold. 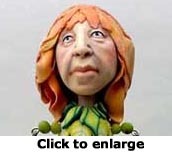 The sizes are 1 in(2.54 cm), 1 1/4 in(2.175 cm), 1 1/2 in(3.81 cm), and 1 3/4"(4.445 cm) from top of head to bottom chin. 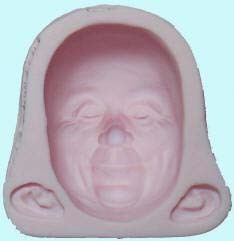 Link: Molda instructional pamplet(in PDF format) is included with each mold. With Rugged Chin and Masculine Brow. 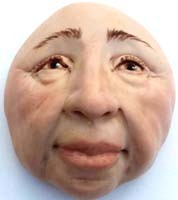 Creates 1.5 in(3.81 cm) to 2 1/4 in(5.715 cm) faces. 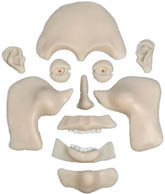 Link: Pf1 instructional pamplet(in PDF format) is included with each mold. 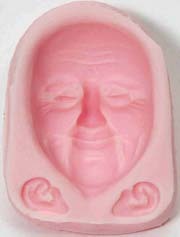 Price: $10.00 each or (buy 2 or more molds at the $10 price for $8.00 each). 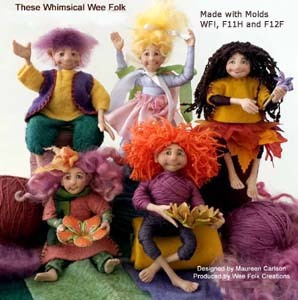 With Smiling Face and Elfin Ears. 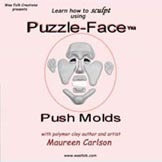 Link: Pf2 instructional pamplet(in PDF format) is included with each mold. 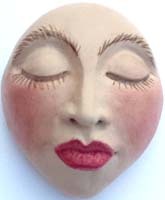 With Full Lips and Feminine Brow. 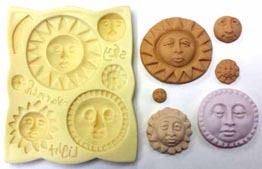 Link: Pf3 instructional pamplet(in PDF format) is included with each mold. 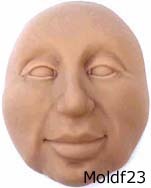 With Flashing Smile and 4 eye variations. Creates 1.5 in(3.81 cm) to 2 1/4 in(5.715 cm). 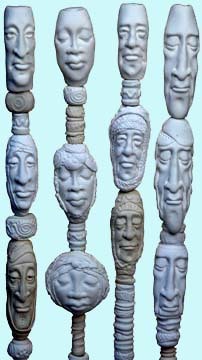 faces. 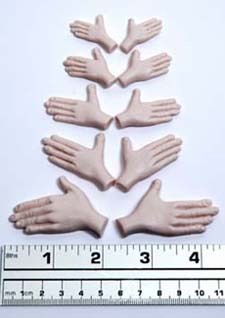 Use with mold-11 hands and mold-18 boot. 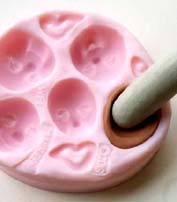 Link: Pf4 instructional pamplet(in PDF format) is included with each mold. 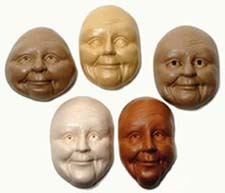 assembling faces from the 4 molds. 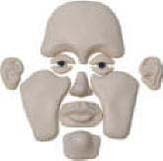 Link: PFdvd instructional pamplet(in PDF format) is included with each mold. 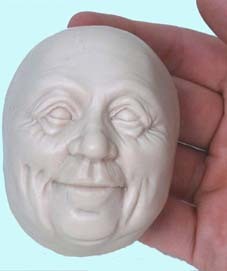 Get all 4 pfmolds listed above for discounted price of $8.00 each and we will add the pfdvd for $8.00 more. Total savings of $8.00 off retail prices. 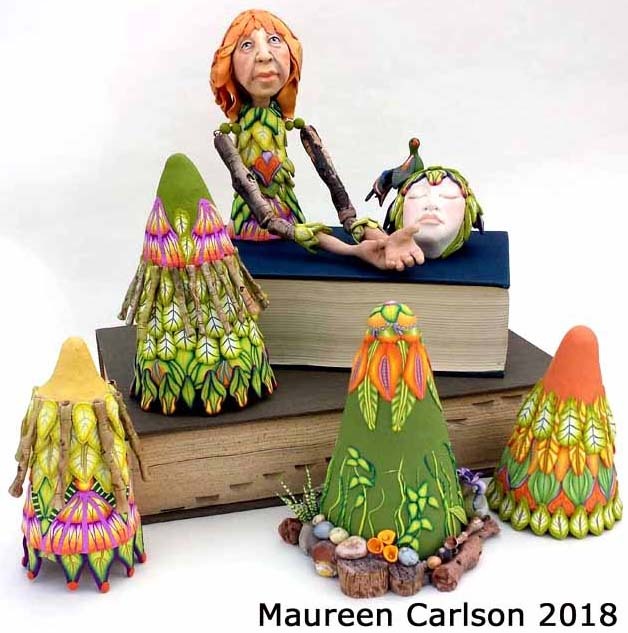 The possiblities are endless, especially using all the parts of 4 different faces and Maureen's easy-to-understand directions on the DVD. Have Fun! 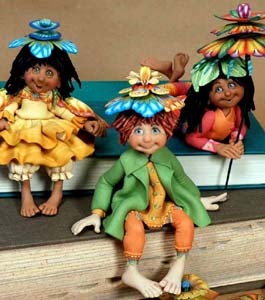 Note: These 2 dolls are wearing the boot moldb18. 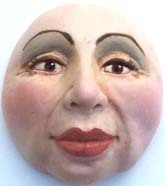 Altered Faces are 1" to 1 3/4 in. (4.445 cm) tall. We no longer carry this book. Please search the Web to purchase. 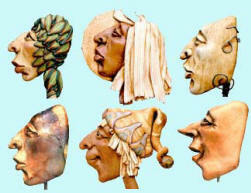 Art Faces in Clay book using Maureen's designer push molds shown above. 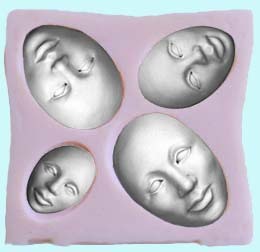 Moldwf1, 5 whimsical faces, all in one mold, 1 inch (2.5 cm) each. 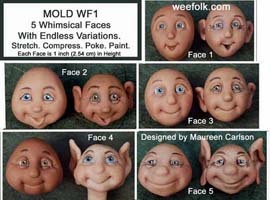 Link: Moldwf1 instructional pamplet(in PDF format) is included with each mold.